In February 2017, a trial excavation was conducted in a tributary of Nahal Hur, south of Horbat Hur (Permit No. A-7913; map ref. 193774-874/576517-627; Fig. 1), prior to the development and widening of Highway 31. 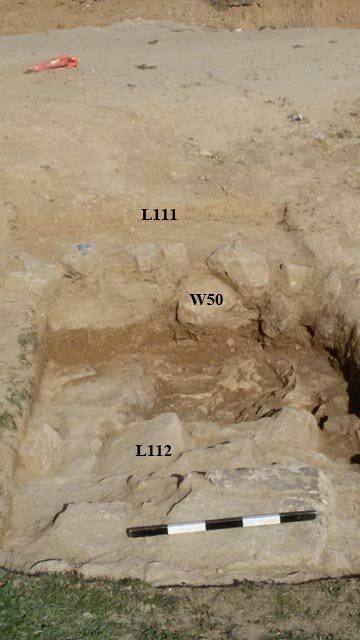 The excavation, undertaken on behalf of the Israel Antiquities Authority Israel and financed by the Netivei Israel Company, was directed by H. Mamalya (drafting and field photography), with the assistance of Y. Al-ʽAmor (administration), M. Kunin (surveying), S. Talis and Y. Abadi-Reiss (consultation) and laborers from Abu Kaf. 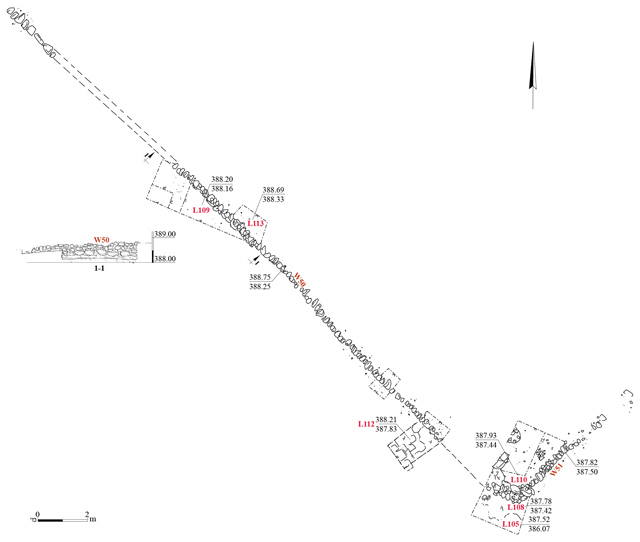 The excavation area (25 sq m) extended along the bank of a wadi channel between the Hebron hills to the north and the Be’er Shevaʽ–Arad valley to the south. The area is characterized by limestone outcrops with flint horizons and light brown loess. Two terrace walls, a small quarry and a scant amount of pottery sherds from the Byzantine and Early Islamic periods were revealed in the excavation. At Horbat Hur, north of the excavation area, remains of an extensive settlement that reached its peak in the Byzantine period were documented, and pottery sherds dating from the Iron Age II to the Mamluk period were gathered (Govrin 2013: Site 63). 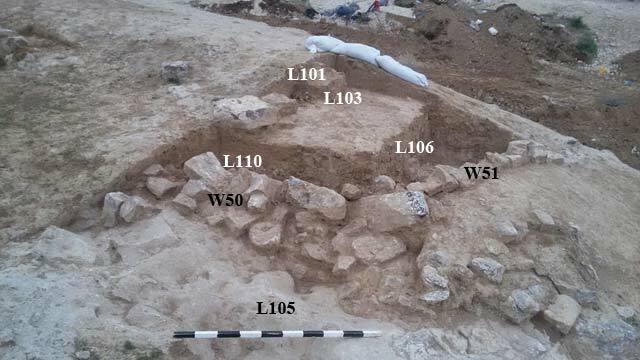 Remains of a farmhouse from the Byzantine period were documented south of the excavation area (Govrin 2013: Sites 100, 101). The following antiquities were revealed in excavations conducted in the past at and around the site: a monastery with a mosaic floor (Varga 2015), a field tower and architectural remains (Nikolsky 2009; Varga 2014) dating to the Byzantine period, a farmstead from the fifth–seventh centuries CE (Varga 2002), a large building (Peretz 2012), two cisterns (Wollach 1999; Zelin 2001) and field towers (Ein Gedi 2001; Paran 2007) from the Byzantine and Early Islamic periods. 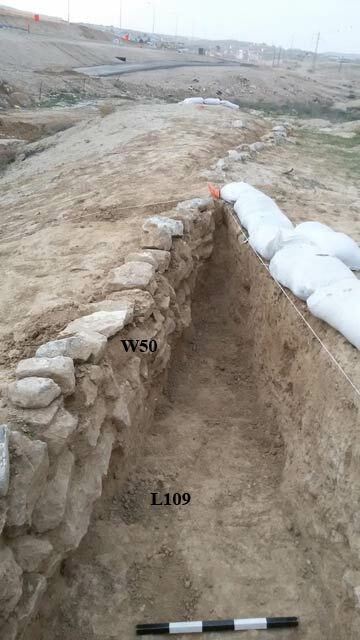 Two agricultural terrace retaining walls (W50, W51; Fig. 2) that formed a rounded corner (Fig. 3) were exposed. They were built of partially dressed stones on a bedding of fine-grained soil (5–10 cm thick) tamped on the bedrock (Fig. 4). Wall 50 was constructed along a northwest–southeast axis and remains of this wall were visible for c. 30 m. It was preserved to a maximum height of four courses. The lower course of the wall was built of medium-sized and large stones arranged lengthwise (c. 0.2 × 0.4 m). The other courses were constructed of medium-sized stones (c. 0.15 × 0.30 m) positioned widthwise; their outer side, facing southwest, was straight (L109; Fig. 5) while the inner side, facing northeast, was pointed (L113; Fig. 6). Some collapsed stones were discovered in several places above the top of the wall, indicating that the wall was originally higher than the four preserved courses. Wall 51 was built along a northeast–southwest axis and remains of it were visible for c. 5.5 m. Although the poor state of preservation along such a short section made it impossible to evaluate the wall’s construction, it nevertheless seems to be constructed similarly to that of W50. 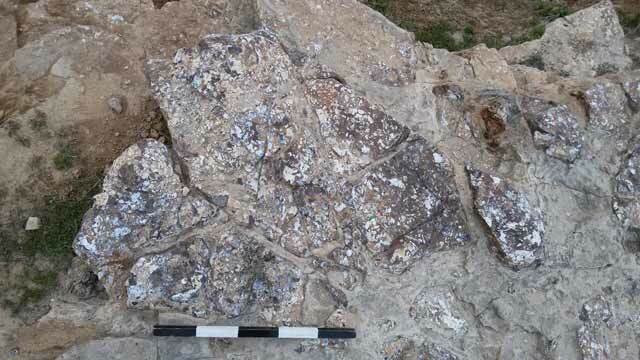 Limestone bedrock outcrops with rock-cuttings and signs of stone detachment on them were discovered south of W50 (L105, L112; Figs. 4, 7). Fractured flint horizons were visible in the outcrop. They were also evident in the stones used to build W50 and W51, and therefore it seems that the stones were hewn in this quarry. 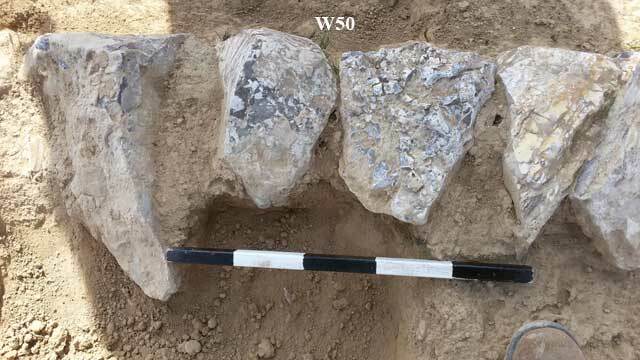 Several fragments of pottery vessels from the Byzantine and Early Islamic periods (sixth–eighth centuries CE) that date activity at the site were discovered in the excavation. It seems that the excavation area was part of the agricultural hinterland of the large settlement that was situated in Horbat Hur during these periods. Ein Gedi M. 2001. Horbat Hur. HA-ESI 113:112*. Govrin Y. 2013. 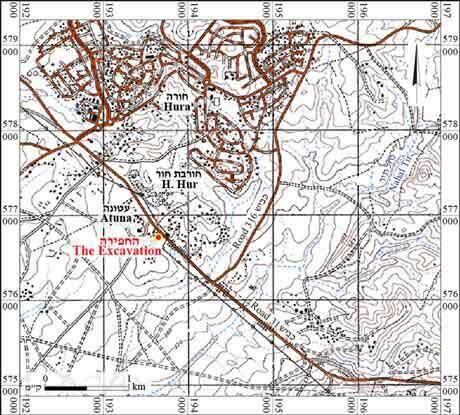 Map of Nahal Yattir (139) (Archaeological Survey of Israel). Jerusalem. Nikolsky V. 2009. Hura, Nahal Shoqet. HA-ESI 121. Paran N.S. 2007. Hura. HA-ESI 119. Peretz I. 2012. Hura. HA-ESI 124. Varga D. 2002. A Farmhouse at Givʽat Mahat (Hura). ʽAtiqot 43 (Hebrew, pp. 107*–113*; English summary pp. 259–260). Varga D. 2014. Nahal Yattir, Yattir Interchange. HA-ESI 126. Varga D. 2015. Hura, Nahal Shoqet. HA-ESI 127. Wollach Z. 1999. Horbat Hur. ESI 17:89*–90*. Zelin A. 2001. Horbat Hur. HA-ESI 113:127*. 3. The corner formed by W50 and W51, looking north. 4. The lower course of W50 and a layer of loess beneath it, looking northeast. 5. The outer, southwestern side of Wall 50, looking southeast. 6. Stones in Wall 50. 7. Fractured flint horizons in limestone bedrock, looking south.